On 14 September 2007, the skyscraper was topped out at 492.0 meters (1,614.2 ft, making it, at the time, the second-tallest building in the world and the tallest structure in Mainland China. It also had the highest occupied floor and the highest height to roof, two categories used to determine the title of “world’s tallest building”. The SWFC opened on 28 August 2008, with its observation deck opening on 30 August. This observation deck, the world’s tallest at the time of its completion, offers views from 474 m (1,555 ft) above ground level. The SWFC has been lauded for its design, and in 2008 it was named by architects as the year’s best completed skyscraper. The SWFC will be exceeded in height by the adjacent Shanghai Tower, which is due for completion in 2014. Together, the SWFC, Shanghai Tower and Jin Mao Tower will form the world’s first adjacent grouping of three supertall skyscrapers. Designed by American architectural firm Kohn Pedersen Fox, the 101-story tower was originally planned for construction in 1997, but work was temporarily interrupted by the Asian Financial Crisis in the late 1990s, and was later paused to accommodate design changes by the Mori Building Company. The building of the tower was financed by several multinational firms, including Chinese, Japanese, and Hong Kong banks, as well as by the Japanese developer and American and European investors. The American investment bank Morgan Stanley coordinated the tower’s financing for Mori Building. The building reached its total height of 492 m (1,614 ft) on 14 September 2007 after the installation of the final steel girder. The final cladding panels were installed in mid-June 2008, and elevator installation was finished in mid-July. 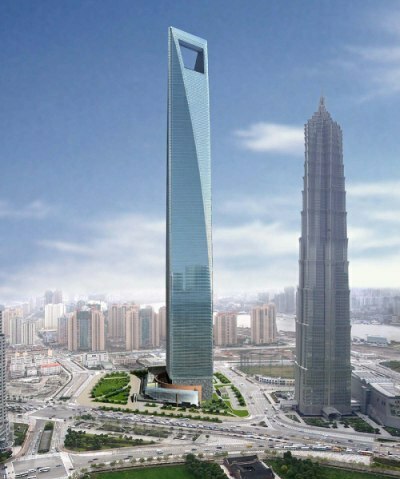 The Shanghai World Financial Center was completed on 17 July 2008, and was officially opened on 28 August. On 30 August 2008, the tower’s observation floors were opened to the public. The tower’s trapezoid aperture is made up of structural steel and reinforced concrete. A large number of forces, such as wind loads, the people in the building and heavy equipment housed in the building, act on the SWFC’s structure. These compressive and bending forces are carried down to the ground by the diagonal-braced frame (with added outrigger trusses). The design employs an effective use of material, because it decreases the thickness of the outer core shear walls and the weight of the structural steel in the perimeter walls.